Q: What is the difference between death and taxes? A: Congress does meet every year to make death worse. "When making out your tax return, it's better to give than to receive." to paying our taxes at least ten years longer." The bartender would squeeze a lemon until all the juice ran into a glass, and then hand the rest of the lemon over. Many people had tried over time (weightlifters, longshoremen, etc.) but nobody could do it. handed the wrinkled remains of the rind to the little man. As the crowd cheered, the bartender paid the $1,000, and asked the little man, "What do your do for a living?" Did you ever notice? When you put the 2 words "THE" and "IRS" together it spells: "THEIRS." If the chance of getting a tax audit is 1000 to 1, why is it 50/50 that it will be your? If the IRS gave green stamps, thousands of Americans would look forward to paying their income taxes. 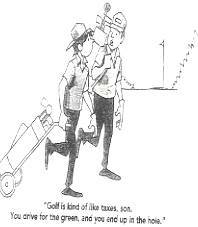 "Golf is kind of like taxes, son. You drive for the green and your end up in the hole."